At the end of March, the Emirates Airbus A380 fleet numbered 75 and the airline has an additional 67 of the type on order. Emirates A380s make up 40% of delivered A380s and 57% of total orders. With such a large fleet, we thought it would be interesting to take a look at a day of operations. We examined flights from 15 April to get an idea of where Emirates sends its A380s and how long it takes them to get there. 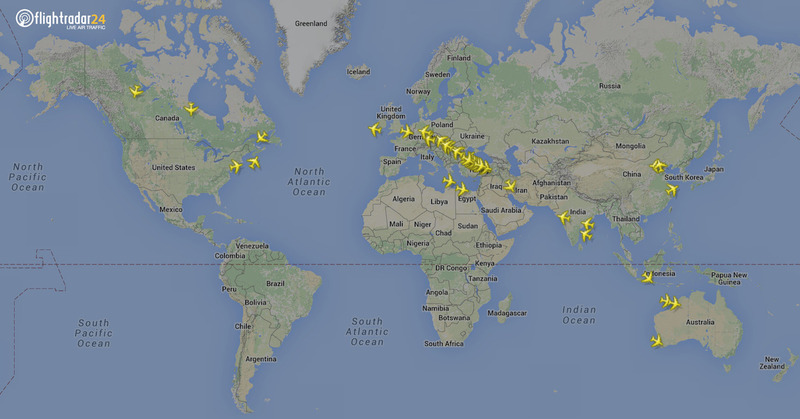 68 Emirates A380s performed 131 fights to 38 airports, covering a total of 1,435,459 kilometers (891,953 miles). Emirates A380s visited 38 cities across 5 continents. 119 of the 131 flights arrived or departed Dubai International Airport. As a city, London sees the greatest number of flights with 8 daily return services to Heathrow (5) and Gatwick (3). See the trails build as flights arrive and depart Dubai. On 15 April, Emirates A380s traveled a total of 1,435,459 kilometers (891,953 miles) or 35.8 times around the world. Average flight length was 10,956 km (6,808 mi). 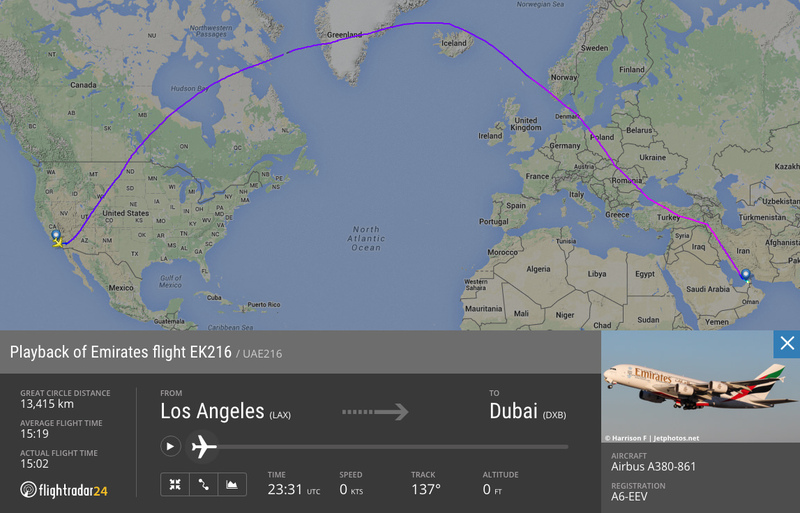 EK216 flew the furthest, covering 14,430 km (8,967 mi) from Los Angeles to Dubai. EK216—the longest Emirates A380 flight (by distance) on 15 April. The shortest flight was over 12,000 km shorter. EK858 covered 968 km (602 mi) from Kuwait City to Dubai. 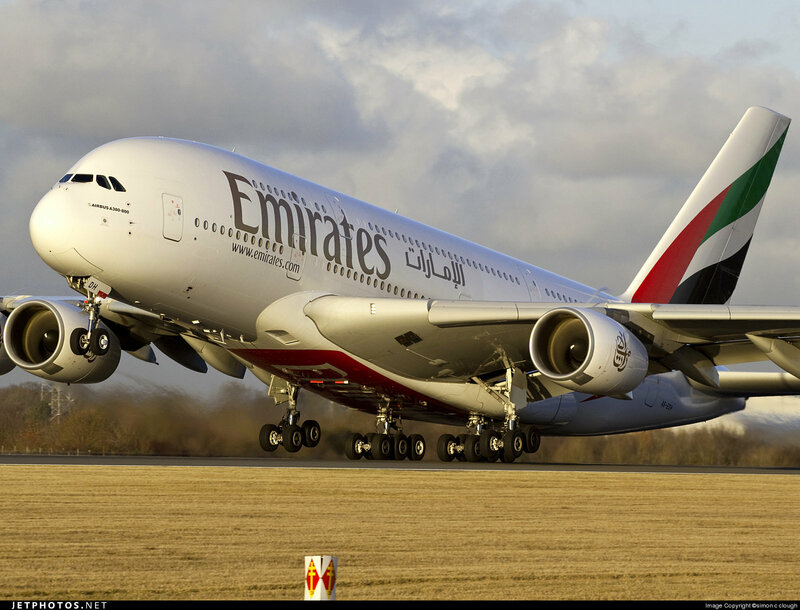 Emirates’ A380 fleet spent a total of 951 hours, 4 minutes in flight over the course of the day. The average flight lasted 7 hours, 15 minutes. EK858 gets the honor of shortest flight for both distance and time. 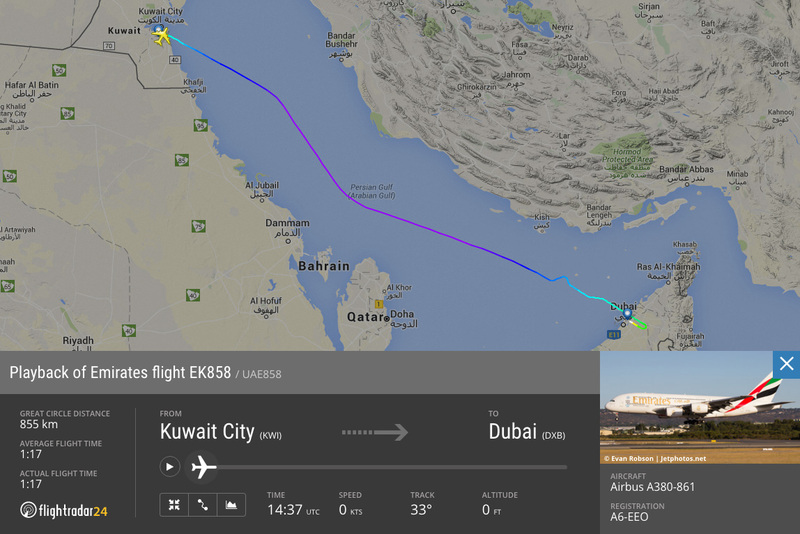 The flight from Kuwait City to Dubai lasted only 1 hour, 17 minutes. 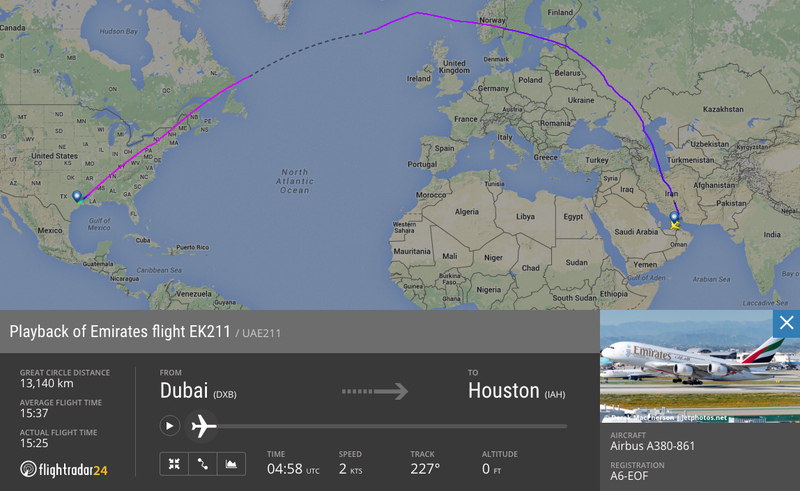 On the other end of the spectrum, EK211 spent 15 hours, 25 minutes flying from Dubai to Houston. EK211—the longest flight (by time) by an Emirates A380 on 15 April.